The story behind the map on page B2 of today's Los Angeles Times displayed a surprising amount of uncertainty on the part of Starbucks regarding the boundaries of the City of Los Angeles. The map was paired with a Q&A about a proposal to inject an energizing dose of Starbucks into a Boyle Heights business district. 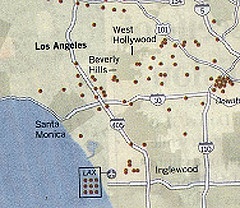 A total of 140 Starbucks stores were identified on the map as being within the city limits of Los Angeles. And although that number may seem low to some, it turned out to be 40 more than Starbucks contended. It should be noted that Starbucks and The Times didn't agree on how many Starbucks there are within city boundaries. I counted 140 based on a listing on the Starbucks website's store locator. Starbucks officials said the number was about 100, but also conceded that they weren't sure which communities were part of the city. It can be tough telling the difference between Sherman Oaks and Thousand Oaks. But, only 100 Starbucks in all of Los Angeles? Really? Give the Starbucks Locator a try and see what you get. I plugged in my home address and received a list of 35 LA-proper Starbucks stores within a five-mile radius of my LA home. Using Starbucks' numbers, that means 35 percent of their LA stores are within jogging distance of my door. So perhaps I should ask what's keeping people awake in the remaining 475 square miles of the city.